Take your time Wait until mid-May to focus on your garden. It’s too cool earlier on and your plants won't thrive. Pick a colour scheme A variety of plants in a similar colour will look more cohesive than a kaleidoscope of colours, vying for attention. Sticking to one colour isn’t limiting – the possibilities are endless. If you concentrate on one colour, or family of colours (Tightwad's fav - whites, creams, sages and chartreuses, with splashes of lavender hues) and then layer a variety of different species, heights and textures such as herbs, grasses, perennials (such as euphorbias, white delphinium, echinachea, scabiosa, hemerocallis, astilbe, dicentra, hostas), and shrubs (such as viburnum and California lilac - in photo above) you will love the result. Pot it up Plant urns and large planters with seasonal greenery and bright colours by the front door that will take you through the winter and provide a focal point when everything else is dormant. You could take a changing seasonal approach with sepia hued chrysanthemums at Halloween, holly, evergreen boughs or gorgeous blueberry branches lit with tiny white lights at Christmas and cheerful spring bulbs for Easter, or make a permanent statement with evergreen shrubs such as boxwood, rosemary and mock orange. 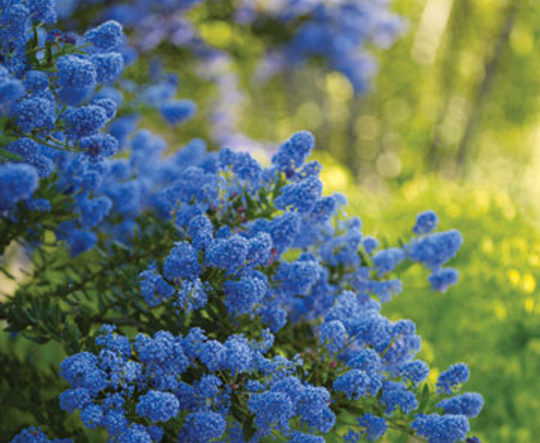 Plant in clusters To maximize the effect of a certain plant species, buy it in bulk and cluster the plants by colour and height - keeping in mind their flowering windows. Plant slow-growing evergreens These will provide your garden with an architectural framework throughout the year. Choose a selection of heights, shapes and textures and stay on top of the pruning. Be patient Gardens take a long time to get the way you want. Most gardeners will tell you that they are never really finished!